Advent has arrived and the Christmas countdown has begun! Tonight we will light the first candle on our Advent Wreath, draw names for our Christkindl just like we did last year, and unwrap our first book after our family Rosary and Christmas Novena! I ♥ Advent! The past few years I have shared some of my "Fun Finds for Advent." I had every intention of finishing up this year's post last Monday or Tuesday before our guests arrived for Thanksgiving, but I just wasn't able to squeeze it in... Even though it is a little late, here is what we are adding to our usual traditions for this Advent! It's not too late to join the fun! Put that Elf back on the shelf and pick up some Wise Men! 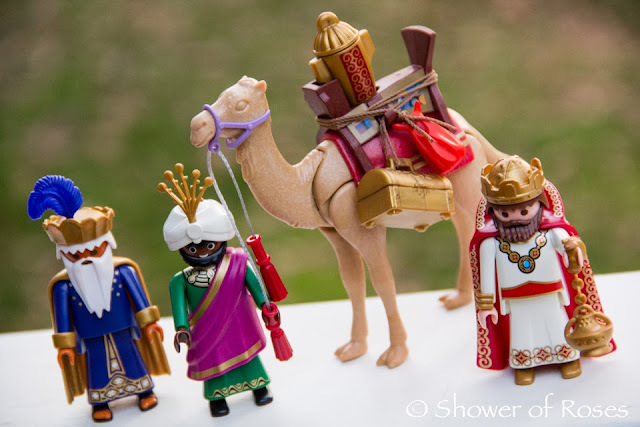 ;) We will be using the Playmobil Wise Men, but any would work just fine. I read that Jennifer will be hosting a link-up, so be sure to take pictures each day! Each week we will be creating a new scene based on the Gospel Reading for the week! I'm simplifying our Jesse Tree (or perhaps I should say trees!) readings this year with the help of Holy Heroes brand new Jesse Tree DVD! 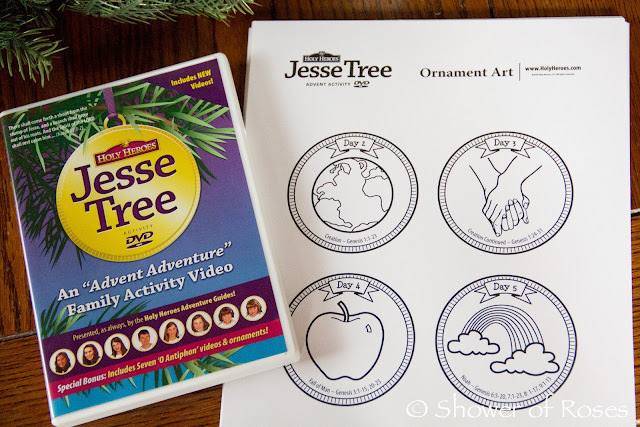 The videos for each day will coordinate perfectly with our new Jesse Tree Swap ornaments as well, and I have also printed out the ornaments for the little ones to color too! 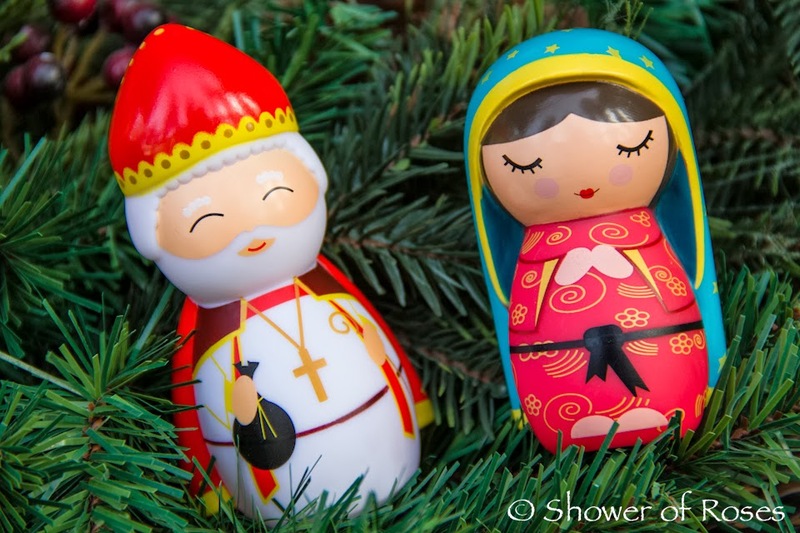 Saint Nicholas from Shining Light Dolls will be making an appearance in our home this December 6th and Our Lady of Guadalupe with arrive on December 12th! Our three girls will also discover Our Lady of Knock, Our Lady of Czestochowa and Our Lady of Lourdes in their Christmas Stockings! When I originally saw these online I wasn't sure I'd like them or not, but they are just as cute as can be in person! As cute as the vinyl dolls are, I really LOVE wooden toys! This past summer, during a special sale, I purchased some more wooden dolls from Armadillo Dreams. I've posted pictures of our sweet Santa Lucia doll in the past. St. Nicholas will arrive on December 6th and the Star Boy will join Santa Lucia on December 13th. I also had just enough in my Paypal account (from All About Learning affiliate sales - thank you!) 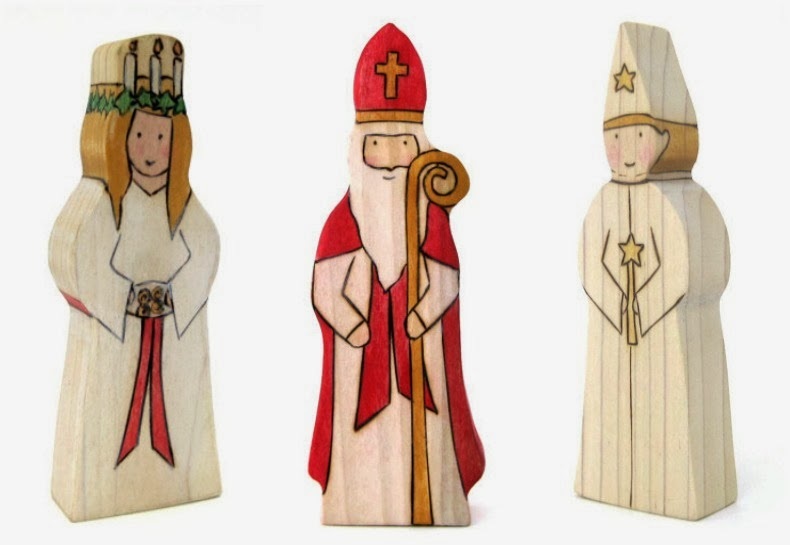 to also purchase the Nativity Set at the discounted price! I am planning on giving that to the family during the O Antiphons for "O Emmanuel." 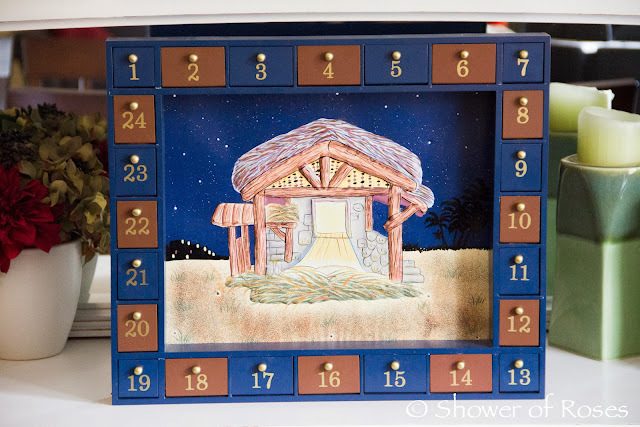 I love that Advent begins on December 1st this year and so nicely coordinates with our favorite Advent Calendar! Along with our original Jesse Tree, this Advent Calendar (pictured above) was one of our very first Advent traditions... It is still a favorite! 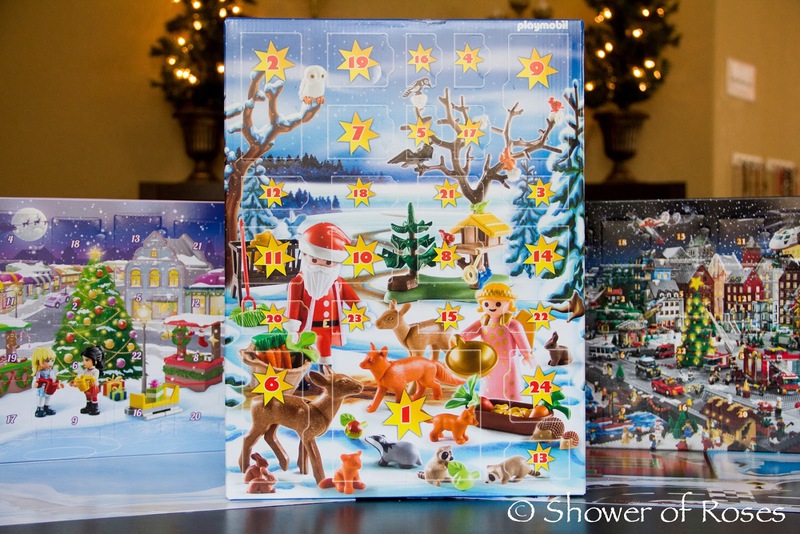 This year, since Advent doesn't often land on December 1st, I did something I have never done before and bought a few totally secular fun Advent Calendars for the children. 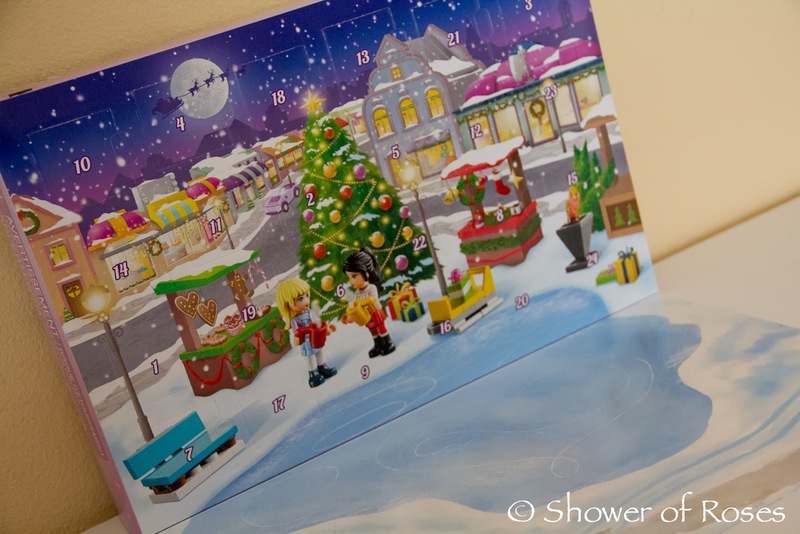 Originally I had just bought the Playmobil Winter Wonderland calendar (for Snuggles and Bud to share), but with the great sales this past week I added the two lego calendars (for the four older children to share) as well, along with a chocolate calendar for my husband and Rose! Our family really loves to assemble puzzles during Advent! In 2010 we assembled the Our Lady of Guadalupe Puzzle. In 2011 the kids loved The Nativity in the Woods Puzzle, followed by the gorgeous Holy Family Jigsaw Puzzle and the They Come Bearing Gifts Puzzle for Epiphany. Last year we assembled the beautiful Glorious Nativity 1,000 Piece Jigsaw Puzzle and this lovely stained glass puzzle. 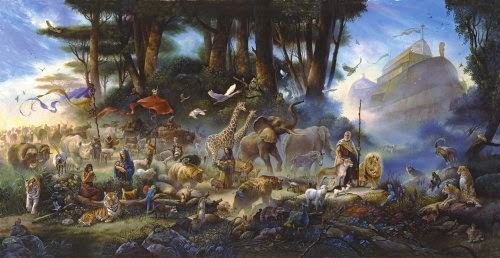 This year we are going to assemble "The Invitiation" - a gorgeous Noah's Ark themed 1,000 piece puzzle (along with this Ark-Full Animals Puzzle or this Animal Alphabet for the younger ones) to go along with some of our Jesse Tree readings! 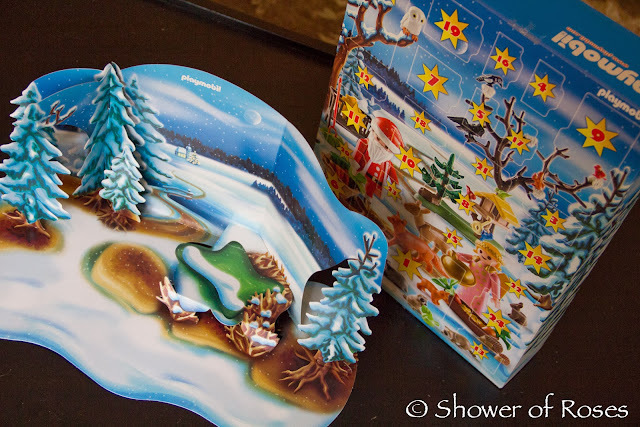 I'm also still considering this lovely 12 Days of Christmas Puzzle for during the 12 days of Christmas.... So pretty! 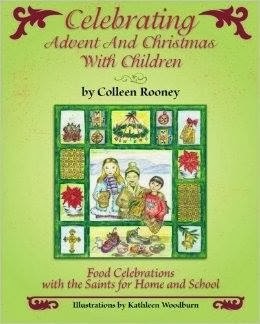 Celebrating Advent and Christmas with Children is a brand new book by Colleen Rooney which was just released last month! Colleen kindly offered to send me a review copy along with a second copy to offer to one of my visitors here at Shower of Roses! It is such a beautiful book, packed with great ideas and recipes, and is a welcomed addition to my collection. I look forward to trying some of her ideas with my own family soon! 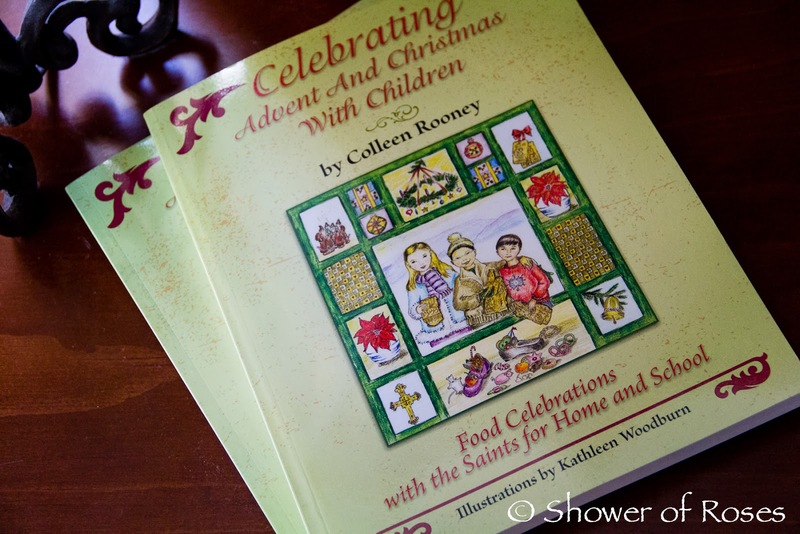 Amazon is currently offering Celebrating Advent and Christmas with Children at a 41% discount, you can currently purchase the Kindle version for only $3.99, or you can enter the giveaway below to possibly win a FREE copy here at Shower of Roses! I hope you all have a very blessed Advent! Thanks for sharing! I'm really interested in the book! I love all your ideas - thanks for sharing! God bless you! We are using the Holy Heroes DVD as well. My son loves it! He wanted to keep going past the first day! It is simple and engaging and I think he's going to get a lot out of it. Your square candles - too cute! This looks great! I am having problems commenting on Google etc...so I'm trying it this way. I have been waiting for advent to begin. Such a blessed time for our family, with some old traditions and new ones as well. Your blog gives me so many ideas. Thank you for all you do and blessed Advent to you and your family. Wonderful items! Have a blessed and holy Advent season! I am such a fan of your blog. Please keep inspiring us. 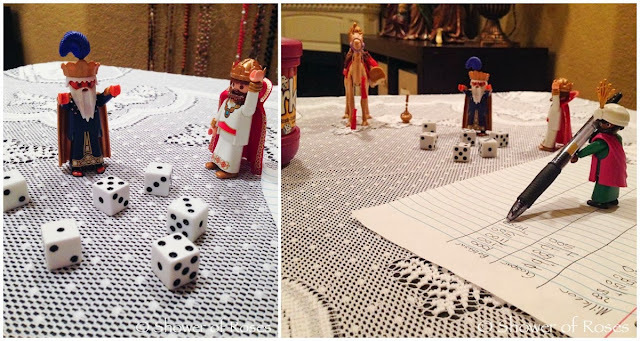 I ran across your blog this evening looking for some information and traditions surrounding St. Nicholas' upcoming feast day for my daughter's preschool class. I love it! Definitely going to be a regular visitor here! Happy and Blessed Advent! I love the wooden St. Lucy!! I have to get one for my little Lucy! These are such wonderful ideas. I love all the Advent suggestions I've found here so far. Thank you! We have the same wooden Advent calendar and are also doing the Holy Heroes Jesse Tree DVD this year. Thanks for so many new ideas! I love all these wonderful ideas! Thank you for the giveaway! Thank you also for sharing your wonderful ideas. I love your ideas!! I put my favorite (affordable and doable) into a word document and have it all in a folder and already referred to it aout 4 times today. Thanks so much for sharing all this!! We are definitely going to do the 3 Kings activity!! I always thought the Elf on the Shelf looked like fun but...never did it because it wasn't meaningful. The book looks like a beautiful resource! Your resources are always great! Now I have more things to add to my advent season! The Jesse Box is FANTASTIC!! OH I love the Three Wise Men Idea!! Sometimes I think your wonderful blog and money leaving our checking account go hand-in-hand. 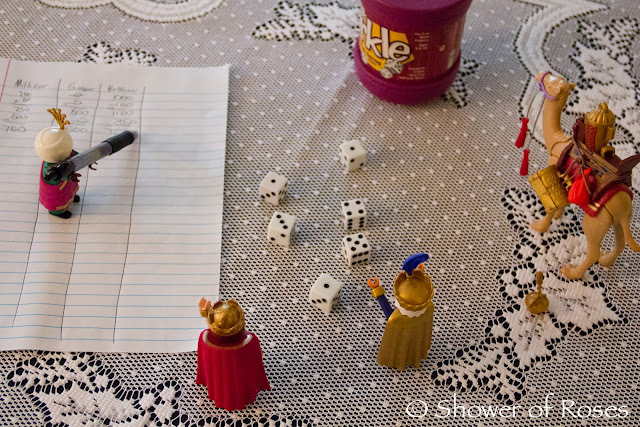 Gotta snag some Playmobil Wisemen. This looks like a great book! Thanks for the giveaway!! Blessed Advent! Thank you! looks like fun! You should check out Illuminated Ink - they also have some wonderful things for Advent and the feast of Our Lady of Guadalupe! Illuminated Ink is great! I have purchased items from them in the past, including a Paschal Candle and Stations of the Cross. One of these Advents I would love to make the Our Lady of Guadalupe Grottos with the children! I have also had my eye on the O Antiphon cards. You mentioned a Nativity Set from Armadillo Dreams, but I can't find it on their site. Can you reply with a link? Wonderful links (as always) and a great giveaway! I absolutely LOVE the wise men idea! Thanks for sharing Jessica! You are awesome! Thank you for these great ideas! We've started the wiseman adventures this year as well! beautiful Jesse Box, thank you for a chance to win! Some great new ideas! Thanks! Love the Wisemen idea! 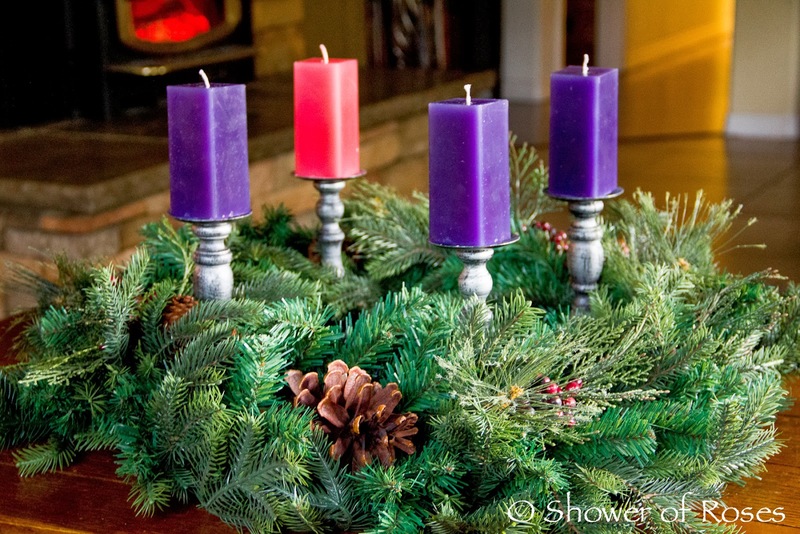 Where did you get your Advent Wreath? For affordable advent candles you can purchase the cheap (they are about $1) glass jar candles that have the religious stickers on them from the candle section at Wal-Mart. I just buy purple and pink ones, then soak the glass in warm water and peel off the stickers. Not only are they cheap and easy to find, the glass keeps the wax from ruining your table. Another great post! This book would be a great resource for staying Catholic during the crazy holiday season! Would love this book! Looks great! More wonderful ideas, Jessica! I love the square candles on the stands by the way! I would love to try the Wisemen idea, but my daughter is so enchanted with our elf on the shelf that I think she would be very disappointed if we skipped them this year! So I usually have them doing some things like reading the Nativity Bible passage, checking out the advent wreath, etc. This new book looks wonderful! What a wonderful resource for any mom! I love your ideas. We used to have the playmobil advent set, but through the years the kids lost the pieces to it. I think we only have very few left. I like all your other ideas too. This year we are adding to our traditions and making a soft manager for baby Jesus. We are still using our felt Jesse Tree with the symbols that my mom made over 12 years ago. I have to find the sheet that goes along with it for the readings. Forgot to mention something in my last comment. 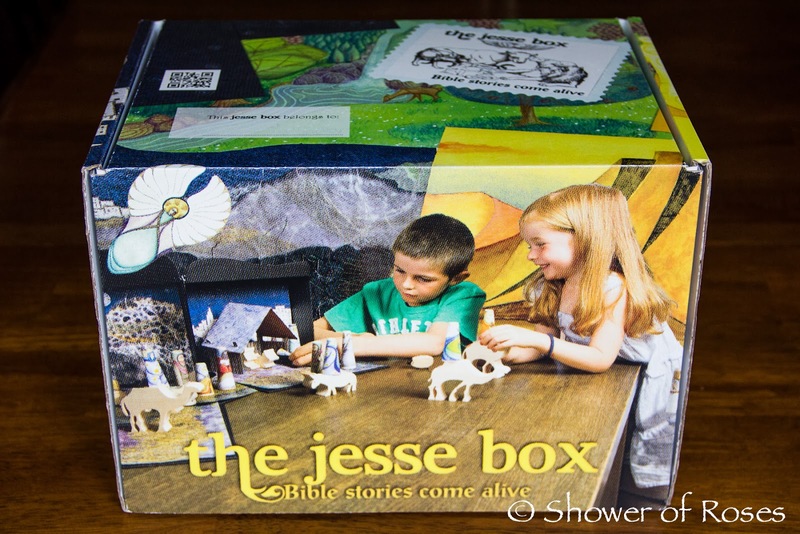 For those people purchasing The Jesse Box set, they should also check out http://thejessebox.com/new-advent-page/ It is the website created by the people who make The Jesse Box, and it is filled with 'lots of freebies (activities, lesson plans, etc.) to go with the box. I've been eyeing this item for a while -- thank you for posting the website with the lower price. Much more in my budget! 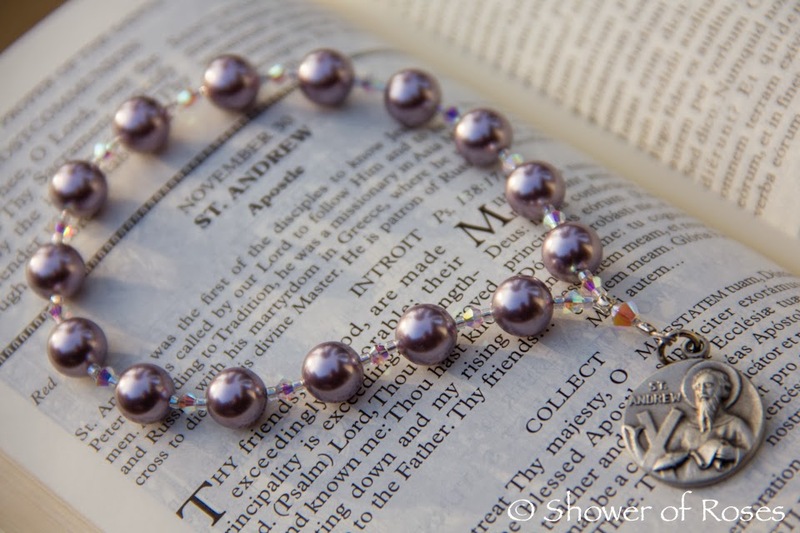 Thanks for sharing this giveaway, and all your beautiful Advent/Christmas traditions. Happy Advent! Oh, my goodness...I couldn't resist! I have just purchased Rooney's book! Thanks for sharing such fun ideas! Thank you for this giveaway! Merry Christmas. I love all of your ideas and plans!!! Blessed advent season! Advent is my favorite liturgical season! Thank you for hosting the giveaway of such a wonderful book! I love all of these. How do you do the Christmas Novena? Does each child take turns. ?Once my kids do the Rosary all they want to do after is play. Please pray for me. God Bless! My husband led the Christmas Novena, following the blessing of our Advent Wreath, the prayers for the First Sunday of Advent (while I lit the candle), and our Rosary. We ended with a song. It took about twice as long as our usual family rosary, but still only about 30 minutes all together. I just offered a prayer for you and your family! God bless! I am so grateful for you! You always have the best ideas! Your blog has provided our family with so much inspiration, not just for Advent. May God continue to bless you and your family. wonderful as always. those wooden dolls are precious. Happy Advent. We are trying to keep it as slow and simple this Advent but still do as many of our fun traditions as possible. starting to nest for this baby coming, but I want to be able to put all the to do list stuff behind me this week so I can just savor the rest of Advent with my family. 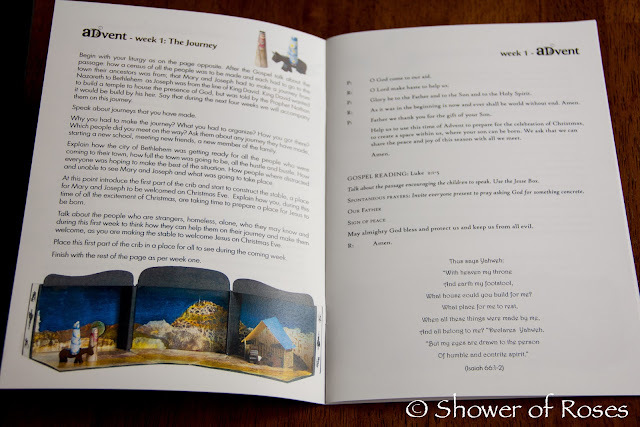 Love the Advent activities you have planned! wonderful giveaway! Thank you for all the great ideas. Thank you for the chance, Jessica! What a perfect giveaway during Advent. I would appreciate a chance to win a copy! May your Advent be filled with God's peace and blessings. Thanks for the giveaway! I love liturgical year resources!! Jessica, You are such a blessing to Catholic families everywhere! I love this post. 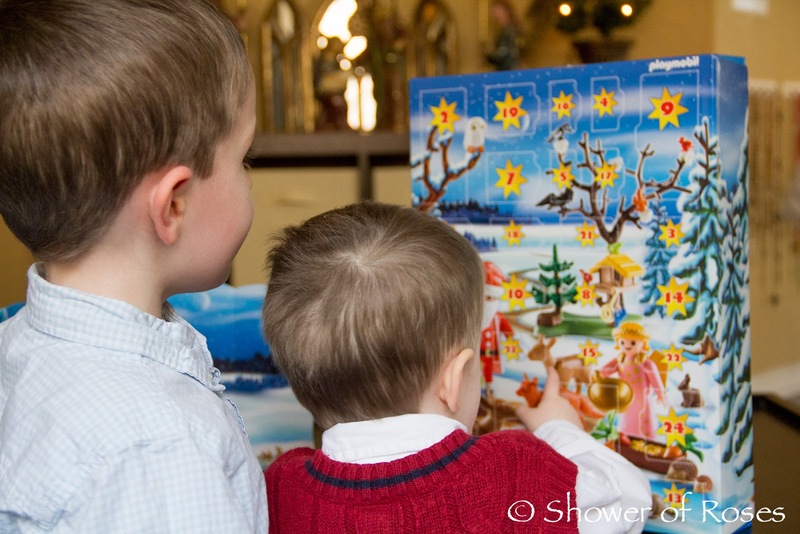 There are so many wonderful Advent activities to take advantage of. Come do Advent at my house Jessica! You have such amazing, inspiring ideas! Thank you for sharing! What wonderful ideas! We are keeping it simple with an Advent wreath and candles, Jesse Tree, and Fontanini Advent calendar. I love this time of year! Love your ideas! Thank you for taking the time to share them! Thank you for the giveaway! Happy Advent! Thank you for the opportunity to win this great book! Thank you so much - your blog consistently inspires me to do more for my family on our faith journey. Would love a copy of this book to add to our Advent collection of ideas! Your blog is such an inspiration to our family! Thank you for the opportunity! Thanks so much for the opportunity to win this lovely book; it looks very inspiring! And thanks for your blog, it has been a blessing to me. Thanks for all of these Advent finds and for the giveaway too! Thank you for all your great ideas (and for sharing other's ideas as well)! Have a blessed advent season! I love those wooden sets, I need to go check them out. You've got lots of great ideas! 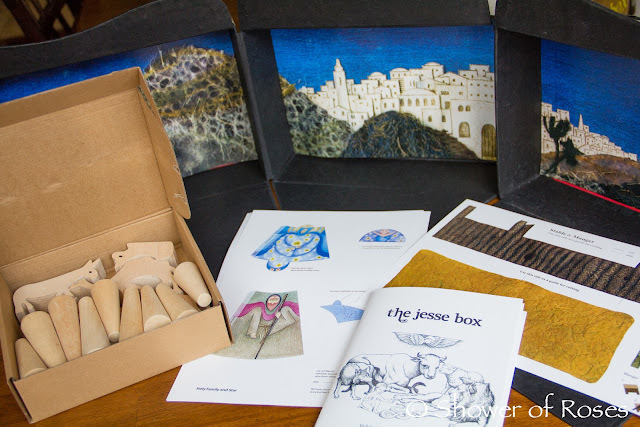 Love angelus press and the Jesse box looks fun. How darling! Love Advent traditions. Thank you for sharing! 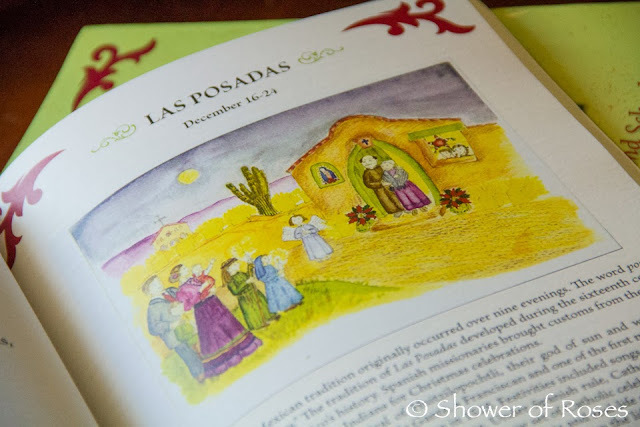 The book looks so wonderful to add to my Advent traditions and collection of books! Thanks for the opportunity! I would love to incorporate activities into our Advent journey, thanks for sharing! The Jesse Box looks like it would be a great for the kids. I'm surprised no one thought of something like this before. A Few Highlights from 2013. . .
On the Feast of Stephen. . .